The 2018 Shadow Catamaran National Championships were held at Gurnard Sailing Club from 29th June to 1st July. What a boat and what a venue! The race administration was first class and Barrie and Amanda Harding, Will Burns, Pete French, Bill, Barry Byham and others arranged great courses and even handed out doughuts to the competitors. Nine races were scheduled over the three days and eventually six were completed in the light conditions. The last days racing was cancelled as the wind failed to materialise. Nigel Harley proved his latent talent again by being in the top three places at the first mark in three races, culminating in a last race podium finish. Dave Downer battled with Tony Wyeth but always managed to narrowly lose a place at the end of each exciting final run on Saturday. Tony finished the first day in 5th place overall but slipped a few places on the Saturday. Ben Willows borrowed a boat and gave it a solid go, sailing quickly and keeping with the fleet until eventually suffering gear failure. Pete Bowen needed a little more wind to show his class, starting well but losing out as the race progressed. James French flew in for the weekend, missing the Friday races. As usual, right on the leader's pace but needed to be able to count more races in the series. Martin Scott was consistent in the light conditions and did well to finish 4th overall – just inches from doing better in several races. Pete Newlands, Carl Blenkinsop and Shaun Kellett all scored a race win but were unable to whittle away at the talent of Robin Leather who never finished lower than second. Carl had great speed, winning the second race but unfortunately his gennaker caught the water on an early hoist on Saturday, breaking his pole and ruling him out. Shaun stormed the first race with a huge win and ended up second overall just two points behind Robin. Robin Leather sniffed out the breezes most consistently and demonstrated his customary calm boat handling to take the overall win and retain the title. 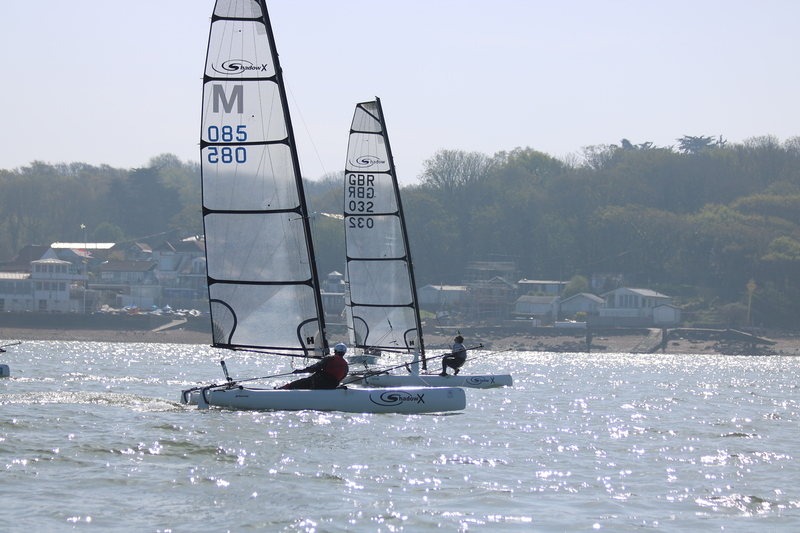 Next Shadow event is the Isle of Wight dinghy champs 28-30 July.